Less than two minutes into his team’s Sweet 16 game against Michigan State, LSU interim head coach Tony Benford called a timeout. A 3-pointer by Big 10 Player of the Year Cassius Winston capped a quick run of eight points by the Spartans. What was more telling was the individual who delivered the first five Michigan State points – freshman Aaron Henry, who was averaging about six points per game. The Tigers never really recovered from that early Spartans outburst. 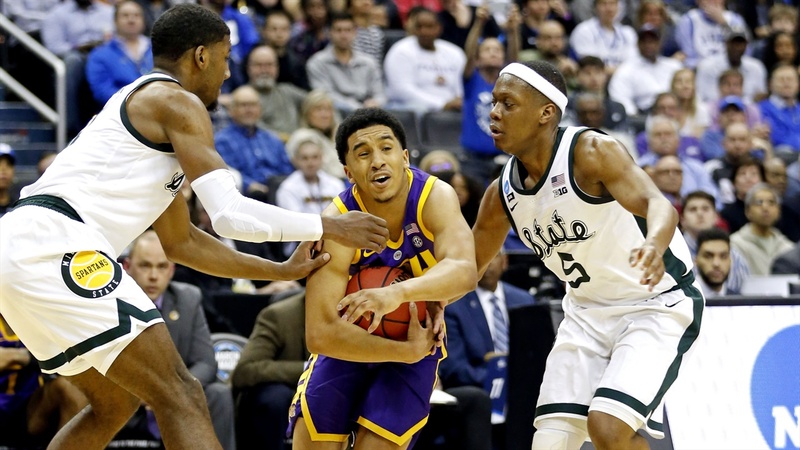 With the exception of a Tremont Waters-led run right after halftime, LSU never had the upper hand against Michigan State. So, the Tigers’ Southeastern Conference championship season came to an end at Capital One Arena in Washington D.C. in the East Regional semifinals Friday night. The Big 10 regular season co-champion Spartans knocked off LSU 80-63. Winston turned in a solid performance with 17 points and eight assists. Waters, his counterpart at point guard, prevented the Tigers from being routed with his 23 points. However, Winston received far more help from his teammates. Winston’s support started with the freshman Henry, who finished with 20 points, eight rebounds and six assists. He made nine of his 14 field goal attempts, including a couple of 3-pointers. Coming into Friday’s game, Henry was averaging 5.6 points, 3.8 rebounds and 1.4 assists per game. Another Spartans freshman had a special night. Gabe Brown came off the bench to contribute 15 points and three rebounds. He was 5-of-7 from the field. Prior to the game against LSU, Brown was averaging two points and one rebound per game. Suspended coach Will Wade is a firm believer in analytics. The numbers showed that Henry and Brown had not been offensive threats this season. Undoubtedly, the Tigers staff did not pay a lot of attention to Henry and Brown. That decision burned LSU. While those two Michigan State freshmen combined for 35 points and 11 rebounds, the Tigers first-year players all struggled. Javonte Smart, who replaced Marlon Taylor in the starting lineup, had no points in 25 minutes. He missed all six of his field goal attempts. Naz Reid had a very quiet near double-double with ten points and nine rebounds. Reid was 0-for-5 on 3-point shots and 5-of-14 overall on field goal attempts. Both Emmitt Williams and Darius Days had four points and three rebounds. So, the four LSU frosh combined for only 18 points – less than Henry alone. Trailing 40-28 at halftime, the Tigers scored eight straight points when play resumed. Waters made two baskets, one a 3-pointer, and sank two foul shots. A Kavell Bigby-Williams free throw left LSU behind 45-41 with 16:45 remaining in the game. There was no timeout called by Spartans coach Tom Izzo. He relied on his talented and experienced team to answer the Tigers run. That scenario played out as Michigan State scored 11 straight points – a 3-pointer by Brown, a basket by Winston and 3-pointers by Henry and Kenny Goins. The Spartans scored those 11 points in exactly two minutes to go on top 56-41. LSU came within ten points one time over the last 14:45 at 70-61. The Tigers trailed from start to finish. Michigan State knocked down 13 shots from behind the 3-point line – its most ever in a NCAA tournament game. LSU connected on only six 3-point shots. But, here were the two most revealing statistics. The Tigers were outrebounded by Maryland 41-34 and shot just 37 percent from the field in their second-round victory last Saturday. LSU could not defeat the Spartans with similar numbers. Well, the Tigers were outrebounded by the Spartans 36-28 and shot only 39 percent from the field. Not surprisingly, LSU was thoroughly beaten for only the second time this season. The absence of Wade was not a major factor Friday. Michigan State was the better team and proved it for 40 minutes to bring the Tigers’ season to a halt in the Sweet 16.